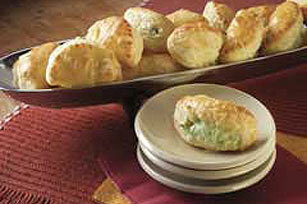 Imagine golden-brown puff pastry enclosing a creamy chicken and herb filling. Then head to the kitchen and make that dream a reality. Preheat oven to 400°F. Mix cream cheese, turkey, onions and parsley until well blended. Season with salt and pepper to taste. Place pastry sheets on cutting board. Cut out 22 circles from each pastry sheet, using a 2-inch round cutter. Beat egg and milk with wire whisk until well blended. Spoon 1 tsp. of the turkey mixture onto center of each pastry circle. Brush edge of pastry with egg mixture. Fold pastry in half to completely enclose filling; press edges together to seal. Place on baking sheet; brush tops with remaining egg mixture. Assemble appetizers as directed but do not brush with egg mixture. Place in a freezer-weight resealable plastic bag. Remove excess air from bag and seal bag. Freeze up to 3 months. When ready to serve, remove appetizers from freezer and place in a single layer on baking sheet. Brush with egg mixture. Bake at 400°F for 15 to 17 minutes or until heated through and golden brown. Use a fork to seal the pastry edges - it adds a decorative edge and prevents the filling from coming out.